Gender Pay Gap is an issue which concerns developed and developing nations alike. In very simple terms, it is the difference between the remuneration earned by males and females for the same work. The Global Gender Gap Index 2017, an extensive report released by World Economic Forum, stated that globally, women in 2017 were paid $12,000 as opposed to men being paid $21,000. 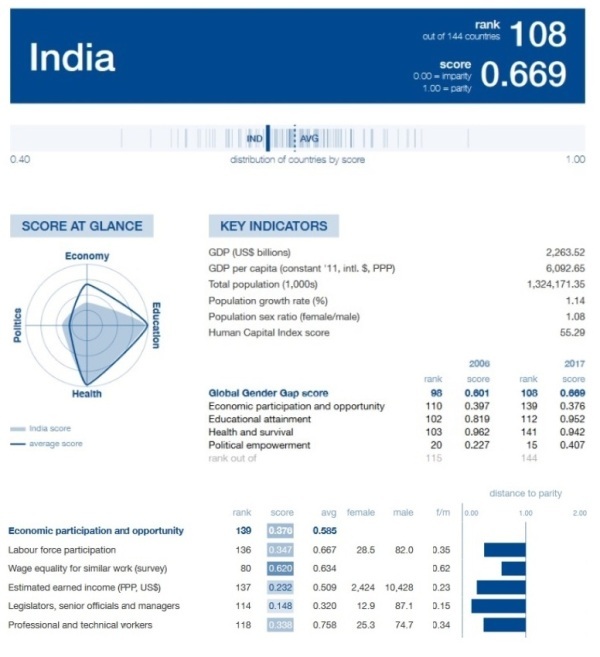 In India, which ranks 108 out of 144 countries in terms of Global Gender Gap, the score for wage equality is 0.620, and the estimated earnings were $2,424 for women and $10,428 for men. In this regard, Iceland (which currently holds rank 1 out of 144 countries in the Global Gender Gap Index), has set a noteworthy example for the entire world, to deal with gender pay gap. As per a report by news agency Al Jazeera, the country, which has had the world’s smallest gender wage gap for nine years, will now penalize companies that cannot certify equal pay among men and women. The law mandating gender pay equity went into effect January 1, after being proposed by Iceland in 2017 on International Women’s Day. The government has been working towards bridging the gaps and reducing economic discrimination, and has pledged to eliminate gender pay gap by 2022. India has been faring extemely poor in terms of economic participation of women for many years now. The Global Gender Gap Report 2017, placed India 139 out of 144 countries, in terms of economic participation, which is the same as its standing in 2006 (110 out of 115 countries). A country ridden with patriarchial structures, which hinders the growth and development of women in every sphere of personal and professional life, these abysmal numbers come as no surprise. In 2009, Centre for Social Research conducted a research study on “Women Managers In India“, which examined the discrimination present various workplaces in our country. Our policymakers and governmental organizations must take these numbers extremely seriously, and work constructively towards reducing the economic gender inequalities, which is prohibiting the nation from realizing its full potential.